On a crisp clear day earlier this fall the new president of Missouri Baptist University was sworn in, but attention was deflected toward a day of service as hundreds of students, faculty and staff members assembled food packages to be shipped to families in Haiti, and bows were tied on Teddy bears to be delivered to children at area hospitals. 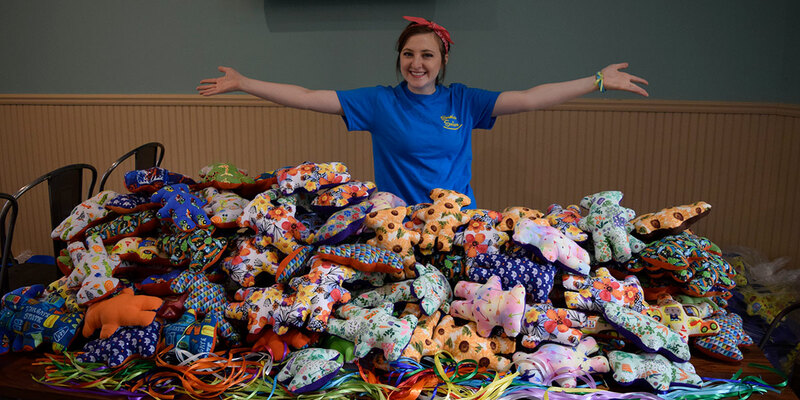 Lindsey Peters, MBU student and founder of her own non-profit outreach, called Sharing Smiles, is in fact all smiles as she stands with a table full of Teddy bears that will be delivered to children at area hospitals. MBU students, faculty and staff members gathered at the Perk to help Peters tie bows on the stuffed bears as part of the university’s Day of Service this fall.